TORONTO -- Larry Murphy knows what it's like to hear the boos raining down from Maple Leafs fans. The Hall of Fame defenceman was mercilessly jeered by Toronto crowds during the lost 1996-97 season -- a scapegoat as the team stumbled its way through the schedule before he was eventually traded. "When you're losing, that's just the way it works," Murphy said Tuesday. "When things aren't going well, fans aren't happy. While things aren't nearly as bad as they were in the mid-1990s -- Toronto remains second in the Atlantic Division and has hopes for a long playoff run despite losses in five of its last seven games -- Jake Gardiner got a taste of that treatment Monday. The Leafs blue-liner made the crucial mistake on a short-handed goal in a 6-3 loss to the Colorado Avalanche, leading some pockets of Scotiabank Arena to voice their displeasure with the polarizing and sometimes-frustrating player every time he touched the puck. 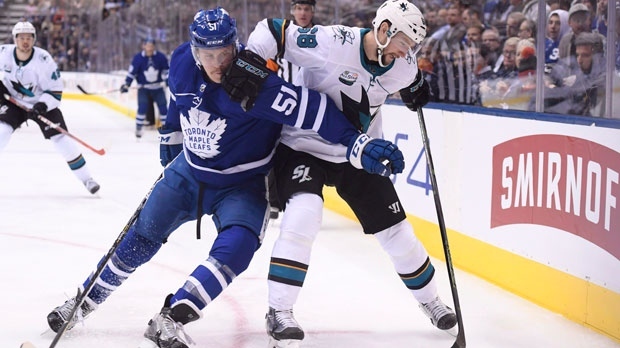 The sequence came on the heels of another goal-creating giveaway in Saturday's 3-2 setback to Boston, one that had fans cringing at the memory of last spring's Game 7 loss to the Bruins in the first round of the playoffs when Gardiner finished minus-5. "Hasn't happened before, that's for sure," an emotional Gardiner said of the boos Monday. "Not something you want to hear ... fans are passionate and they want to win." Murphy, who played 151 games in Toronto prior to waiving his no-trade clause to finalize the deal that shipped him to the Detroit Red Wings, said it's important to block out the noise in difficult times. "You just focus on how you play," Murphy said in a phone interview with The Canadian Press. "You have to look at yourself." Born in Whitby, Ont., and raised in Toronto's east end, Murphy registered 100 points with his hometown team as part of a career that spanned 21 seasons. He won the Stanley Cup immediately following the trade with Detroit in 1997 and then again in 1998 -- his third and four titles -- before retiring after the 2000-01 season. "Just because somebody spews and dumps on you, it doesn't really mean it's an accurate evaluation of how you're playing," said Murphy, a member of the Hockey Hall of Fame's 2004 class. "(Gardiner) just has to answer to his teammates and the coach, and, of course, to himself." Murphy, who had 288 goals and 929 assists for 1,217 points in 1,615 career games, said the boos at Maple Leaf Gardens never impacted him on the ice. "I just continued to play well," said Murphy, sixth all-time in scoring among NHL defencemen. "The team wasn't winning, so fans are upset. They voice it. "I enjoyed my time in Toronto. The only thing I wish for is we won more often, and that wasn't the case." The current Leafs came to Gardiner's defence Monday. "(The) guy does everything for this team," winger Mitch Marner said. "People don't give him enough credit." Added fellow blue-liner Morgan Rielly: "Guys make mistakes out there all night. That's the way the game is. It's played on ice, so things happen that can be unpredictable." Murphy and Gardiner aren't the only high-profile defencemen to have heard boos in Toronto. Bryan McCabe, another blue-liner with offensive flair, drew the ire of some Leafs fans during his seven-season run in Toronto from 2000 to 2008. The numbers show that Gardiner, who is coming off a career-high 52-point season and is set to become an unrestricted free agent July 1 with the potential for a big payday, is not the main issue for a team that finds itself in its first slump of 2018-19. The 28-year-old has been on for 60 of Toronto's 161 goals for and 36 of the opposition's combined 128 against through 45 games. His 24 points ranks second among the team's defencemen behind Rielly's 42. But there has been a growing fan angst toward the player during his eight seasons, where the mistakes in his high-risk, high-reward style are often glaring. "The good thing about our fans is they're passionate," Leafs head coach Mike Babcock said after the loss to Colorado. "They paid their money, they're allowed to say what they want." Murphy said it's imperative Gardiner focuses on his own game and ignores opinions outside the locker-room walls. "Hopefully, he just looks at how he's playing," Murphy said. "The rest of the stuff, you can't control. "It just goes hand-in-hand with playing hockey in a city like Toronto."